Turning 21 is cause for celebration! A 21st birthday is a memorable occasion, and printing your own birthday invitations can ensure that everyone is there to share in the celebration. Most 21-year-olds would rather spend their cash on the actual party instead of the invitations, so using free ones just makes sense. 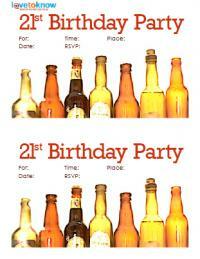 Download a 21st birthday invitation and fill in the appropriate celebration information. This is the easiest and cheapest way to get everyone to the milestone birthday party without spending a lot of money. The invitations below open as a .pdf file. You can fill in the information online or you can print them and fill the information in using your own handwriting. 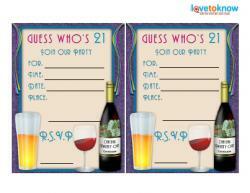 Choose the invitation that fits your particular party the best. To make your custom invites, you'll need to choose what style of invitation you'd like to make, and then find graphics and wording to put on your invites. Full-page flyers are best for a blow-out bash, while invidual invitations keep the party small, so you don't have to worry about it getting too wild. Print invites off using your computer and printer. Make sure you have enough printer ink to keep the images clear and colorful. Make these invites by opening your word processing program and selecting their invitation template, and filling in the proper information. Customize it by swapping out your own graphics and wording. Use scrapbooking and craft supplies you already have on hand, which requires no additional money spent. This type of invitation may take longer and you may not have your first choice for colors and graphics, but they can add a little something special to the occasion. Hand the invitations out personally in order to save money on postage fees. Only mail invites to people who you don't encounter on a regular basis, like friends and family who live out of town. Most 21st birthday parties involve alcohol. 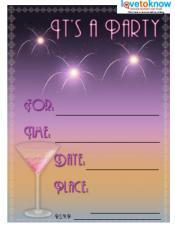 Inclue it on your invitations by featuring mixed drinks, beer bottles, or martini glasses. Drinking, however, is not the only theme for a 21st birthday. Casino themes, luau themes, and even just general candles or birthday cakes with the number 21 on them are perfect graphic ideas for the invitations. If you're printing the invitations, you can find free clipart at Webweaver, Artvex and CoolClips, along with your own card or stationary printing software. If you're using your leftover scrapbooking materials, look for papers with similar colors and embellishments and stickers that are related. This way, you don't need to buy any additional supplies. It's time for a party, it's time for fun, Elizabeth is turning twenty-one! Cheers to another year, so let's all share a beer! John is 21! Spin the wheel, pull the slot, turning 21 is hot! Sand between your toes feels better when you're 21! After your opening birthday line, make sure you include the typical party invitation information, including date, time, location and RSVP contact. Free printable invitations can be found from a number of websites, and printing individual invitations ensures that there are neither too many nor too few to share with friends, family members, and other party guests. 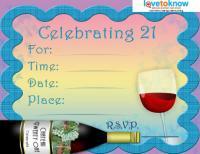 Any birthday party invitation is suitable for a 21st birthday, too. 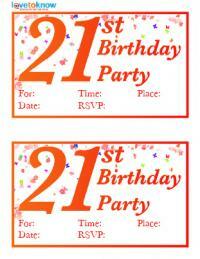 All Free Invitations has a nice selection of 21st invites that are perfect for guys and gals, while Greetings Island and Invitationland both offer great birthday invitations you can use for a 21st. 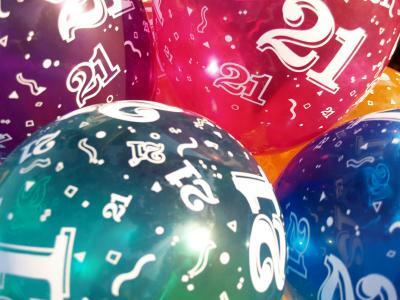 A 21st birthday is a grand occasion, and free printable 21st birthday invitations are a great way to spread the word and invite friends and family members to celebrate this once-in-a-lifetime coming of age.